We know what you’re thinking; how could a site that already lets you win cash by playing video games possibly get any better? The idea itself is near perfection! Fact is, they’re always looking to improve Virgin Gaming and have a full team of sleep-deprived developers working ’round the clock to make it the best place to play. See what our partners have in store for you here. It takes time to roll out new features and enhancements with a site as complex as theirs, but here’s a sneak peek at what they’re working on. For you. Because without you, they’re just a bunch of dudes with a website. Xbox Live Tournaments App: Join tournaments, challenge players, cash out and more from within your Xbox 360 dashboard! 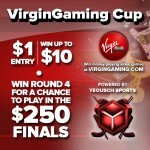 Private Leagues & Tournaments: Set up your own tournaments to compete for cash with your friends, clan or frat, or even start your own competitive gaming league powered by Virgin Gaming! Points & Achievements: A revamped Virgin Gaming reward points system is in the works, plus new player profile pages with badges and achievements. So there’s a quick look at what’s coming. What else would you like to see? Leave them a comment with your wishlist and let them know how they can build a better Virgin Gaming.